The weather at Brands Hatch was unusually warm for this time of year and was completely dry up until Sunday – then the heavens opened! Storm struggled for a set up that suited him in FP1 and FP2 and ended both session’s in 8th position. Saturdays Qualifying was again in dry conditions Storm was still struggling to find the pace which left him on a 9th place grid position for Saturdays Race. Race 1 Storm got a good start from his 9th place grid position and went into the first half of Lap one battling with Jack Scott, Asher Durham, Edward Rendell, Jack Nixon and Jake Archer, But Storm never gave up and pulled through the pack – unfortunately Asher Durham crashed out on Lap 6 of the 10 lap Race, which moved Storm up to 4th Place which is where he finished moving himself to a second row a 5th place start position for Sundays race. The Weather in race two was horrendous with the bikes going out on full wets. There was a lot of standing water which caught quite a few riders out! This is the first wet Race of the season!! Storm rode quite gingerly for the first few laps – not wanting to make any silly manoeuvres which would of cost him valuable points and the possibility of crashing – as so many had already! On Lap 6 of the 12 Lap race Jack Nixon Went down just in front of Storm but luckily Storm managed to avoid his bike that was left in his line. They all continued very cautiously in the tricky conditions then Unfortunately Eugene McManus had a coming together with Storm and McManus went down nearly collecting Storm in the process - it was more luck than anything that he stayed on! Storm went on to finish the Race in a very hard fought for 3rd Position. 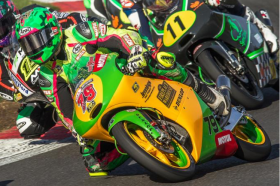 Storm Secured a 3rd in the Championship, Jake Archer had already taken the Hel Performance Motostar Championship for 2018 at the last Round and Jack Scott claimed the second place title.